The Dordogne department is crossed by the Dordogne river to the south. The Vezere river crosses the east of the department with the most popular part of the Vézère running north-east from Limeuil, where it meets the Dordogne, to Montignac and the Lascaux caves. To the north of the department are the Isle river and the river Dronne. The character of the department changes enormously around each river with the Dordogne and the Vezere rivers attracting lots of tourists to the many beautiful and interesting destinations whilst the Isle and Dronne are much quieter and more condusive to a much quieter holiday with the focus being on the pretty countryside. 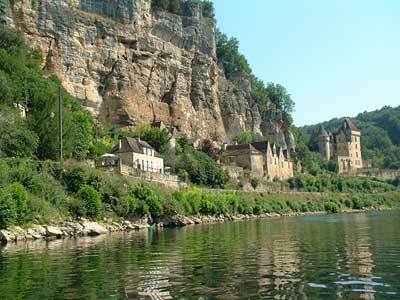 Below are some of the highlights to see along each of the rivers in the Dordogne department. The Dordogne River is of course one of the reasons that the Dordogne department is one of the most popular holiday destinations in France. The highlight of this river is probably the stretch from Tremolat to la Roque Gageac. During this fairly short stretch it passes through four of France's most beautiful villages and is close to the Dordogne's favourite town - Sarlat. Boat trips: From Bergerac, Beynac and La Roque Gageac it is possible to take an organised rides upstream on a boat ('gabarre'). Beaches and swimming: There are several river beaches along the Dordogne River, the one at Limeuil being of particular note. The valley of the Vézère is often cited as the home of prehistory in Europe, and there are numerous prehistoric attractions to be found, ranging from the caves at Lascaux to dinosaur theme parks. There are some 175 prehistoric sites listed along this stretch of the River. Les Eyzies, half way along the valley, cites itself as being 'the world capital of prehistory' - with good reason, not only does it have a very impressive prehistory museum but it is surrounded by some of the best of the areas caves and troglodyte dwellings. Many of the caves, prehistoric sites and castles along the river are included in their respective sections on this site. Both the popular town of Le Bugue and the delightful Montignac, home of the Lascaux caves sit on the banks of the Vezere river as well as Saint-Leon-sur-Vezere, another of France's most beautiful villages. Canoeing, horse-riding, walking, mountain biking and quad biking are all available along the River Vezere Valley. The Dronne is a charming river in the northern part of the Dordogne department that passes by Brantome and Riberac. Brantome is one of the absolute highlights of a visit to the Dordogne department and not to be missed. You will come across its charms in many places in the region as you travel around - for example at Nontron and Bourdeilles and the most beautiful village of St-Jean-de-Cole. Whilst in the area visit the beautiful Chateau of Puyguilhem and the caves at Villars. Perigueux is the undisputed highlight of the Isle valley and is a gem of a town with its Roman and medieval past. Neuvic has a quiet charm and a pretty chateau and there are various villages along the edges of the river. See our separate article about the Isle River for highlights of this stretch of river in eastern Dordogne.